Herbaceous peonies (also known as bush peonies) die to the ground in Winter. They re-emerge in March, or when the snow melts. Many find that they are deer resistant, but not always. Peonies are long lived, minimal care plants. Lactiflora is the most common species parent found in nurseries. It is native to China. Most lactiflora cultivars produce sidebuds. Hybrids are crosses between two or more species. They bring additional colors, foliage types, and earlier bloom season. Most hybrids produce only one bloom per stem. Itoh or Intersectional peonies are a cross between the herbaceous (or bush) peony and the tree peony. These crosses have produced new, exciting colors. 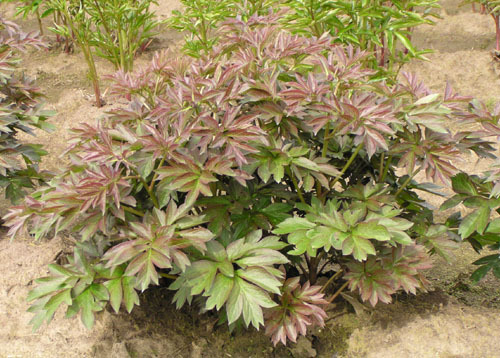 The plants have the lovely leaf form of the tree peonies, but die to the ground in the Winter. 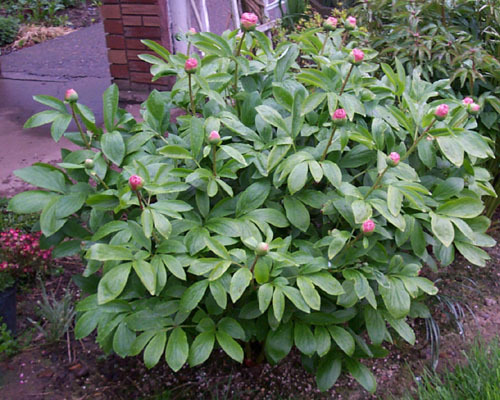 The plants are strong and healthy with a nice rounded bush form, generally shorter than most bush peonies. Since they are recent introductions and are still in short supply they command a high price. Tree peonies are called tree peonies for the woody stems that they have. Tree peonies have woody stems that defoliate in the fall, but the woody stems stay intact, above the ground. They tend to bloom earlier and with larger flowers than the bush peony. They are generally slow to increase. Some are sold as named varieties; however, they are frequently sold by color. Tree peonies can have a height as little as 20" tall, all the way up to over 8' tall, depending on the plant habit, maturity, and pruning. 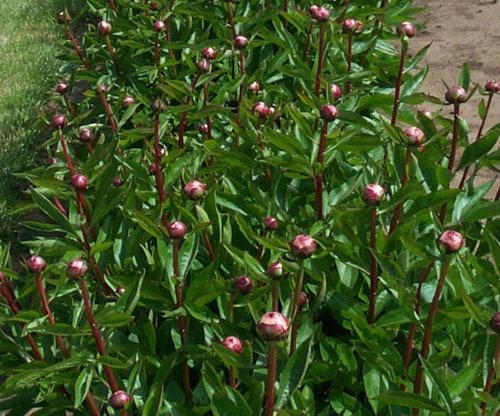 All of our tree peonies are field grown on their own roots. 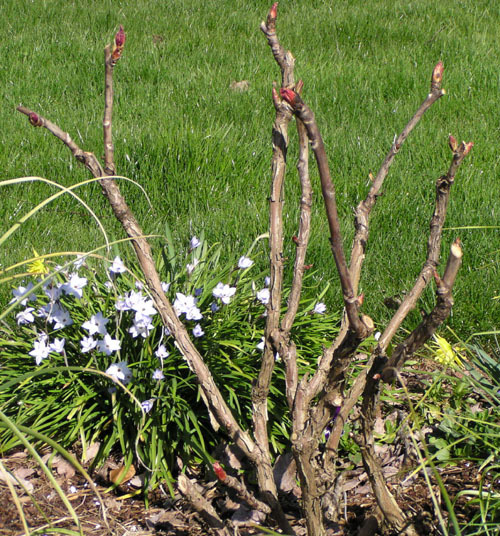 Some other growers use a quick way to increase tree peonies by grafting a piece from the tree peony parent plant onto a piece of herbaceous root to provide a quick-start energy supply for the tree peony. Sometimes the vigorous herbaceous root takes over to the detriment of the tree peony. In some cases, the herbaceous peony will come up and bloom beside the tree peony. Own-root peonies are also an advantage if the top is damaged by serve freezing or accidental cut down- the roots will send up more buds and stems that will be the same variety as planted. SINGLE peonies are composed of a few broad petals, a single row of which surrounds a mass of pollen-bearing stamens and see-bearing carpels. Examples: Athena, Dad, Krinkled White, Scarlet OHara, Sea Shell. With JAPANESE-type blooms the doubling process has begun. The filaments of the stamens have broadened and the anthers have become extremely large. Examples: Nippon Beauty, Madame Butterfly. Examples: Paula Fay, Coral Charm, Miss America, Buckeye Belle. The BOMB-type flower has petaloids derived from both carpels and stamens with are much broader, without any crown, but still are clearly differentiated from the guard petals. Examples: Red Charm, Raspberry Sundae, Monsieur Jules Elie. The FULL DOUBLE bloom completes the process of doubling. All the stamens and carpels have developed into petals resembling the guard petals. Examples: Ann Cousins, Gardenia, Kansas, Paul M. Wild, Tourangelle.